Between the North Sea and the Baltic the direct route is the Nord-Ostsee-Kanal (NOK), usually called the Kiel canal in English. For the western part of the canal though there is another option - the River Eider. This river comes out a bit North of the Elbe (Eider Safe Water buoy 54 14.5483 N 008 27.6246 E), Tönning being the last town on the way out. It’s just a little bit North of Helgoland. 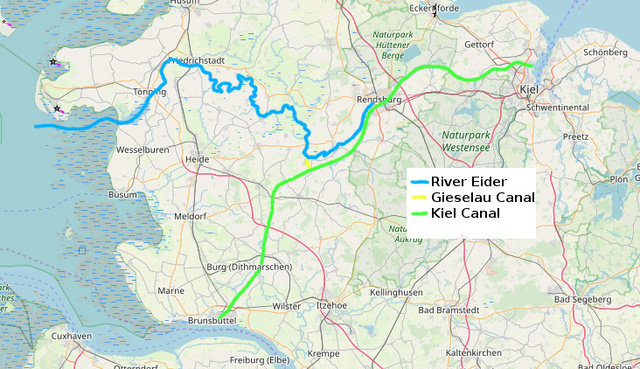 It’s connected to the Kiel Canal by the short Gieselau Canal at km 40.5 of the Kiel Canal (54 10.4283 N 009 26.5811 E). The river goes to Rendsburg but is not connected to the canal there. I decided to take the river when I left Rendsburg, for something a bit more interesting, and because I could go to Helgoland that way and then to the East Frisian islands (Norderney, etc.) without having to deal with tides and traffic on the Elbe. This route does cross the approach to a TSS, but this was much less of a problem than the fishing boats. I couldn’t find much information, in English anyway, about the Eider so I thought I’d write a guide. The river is not really a river anymore. I think it used to go most of the way to the Baltic, but part of the course was used for the Kiel canal, and the rest has been cut up by locks. So it doesn’t flow like a river any more. There are five locks and four bridges. Below the Nordfeld locks it’s properly tidal. Above that there is almost no current. There does seem to be a slight tidal stream though, enough to swing you around if anchored. Locks cost 10 EUR for a boat 8 - 12m. Officially they cost 5 EUR, but they seem to be charging double and give you two tickets if there are no other boats in the lock. Use a fender board or put fenders horizontally - the side of the lock are corrugated metal. The locks and bridges have limited opening times and for the lower part you need to coördinate with the tides. This could mean you need to hang around for a while. The locks are also pretty slow to operate, and you need to get out and walk up to an office to pay. This is totally unlike the free bridges in the Netherlands where you hardly have to slow down. At the locks to the Kiel canal there is a lot of space, but it was nevertheless pretty much full when I got there in the evening. I think most of the boats were just stopping on the way along the Kiel canal. There are toilets round to the left of the lockmaster’s office which are not signed. Overall the route is pretty boring. I was amused by the novelty of sailing past a cow having a bath but otherwise it’s just flat, fields, cows. There is almost no traffic though, so if you want a quiet place to hide for a while it’s not bad. There are a few fishing boats around, an occasional cruise boat, and very rarely yachts. The river is mentioned in The Riddle of the Sands, in which one of the main characters sails up it. Obviously you would need to be set up to tack quickly but it seems possible. I sailed a bit but only when the wind was in the right direction. There wasn’t much wind at all most of the time I was there. It’s worth remembering you are allowed to sail here, if you have just come from the Kiel canal where you must use the engine.